“Ptarmigan Ridge is another great hike in the North Cascades in Mount Baker-Snoqualmie National Forest, Washington. 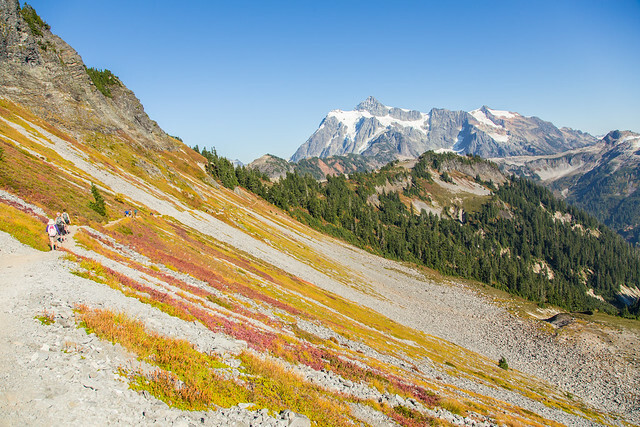 The trail starts at Artist Point, 12 km northeast of Mount Baker summit. Artist Point is the starting point for a number of great hikes, such as Table Mountain and Chain Lakes. And a bonus… the road to Artist point is paved the entire way!! The trail is almost entirely in the open, with shaded areas in the premium. The route follows a well built trail traversing scree slopes of the ridge. There are non-stop views on this hike, including Mt. Baker, Mt. Shuksan, numerous glaciers, ice fields, lakes and former glaciers, which appear to have a short time left; we even saw five mountain goat. Today was an amazing mid-September day, with highs in the upper 20s, no clouds, no wind and no bugs, making for an enjoyable hike. The Ptarmigan Ridge trail seems to go on for a long time. We finally had to make a decision when to turn around. This hike would make a great area for camping, as there are many locations to pitch a tent and so much to explore. “The trail was fairly gentle and well-maintained (somewhat similar to the Garibaldi Lake trail). Its lower portion (till about 1500 m) was practically snow-free. However, once we reached the alpine fields, snowshoes and gaiters became really handy as the snow was getting soft and deep. Following the snowshoe trail, we ascended the partially covered peak from the east side. The panoramic views from the top were truly magnificent: Mt. Baker, Shuksan, Border peaks, Mt. Redoubt. Some stats: overall, it took us about 3 hours to reach the top. There was practically no wait at the border in either direction. “Border traffic at the Sumas crossing was minimal; and once across, it is straightforward driving to the Baker National Park. We couldn’t have chosen a better day to head down to the Mount Baker area. The temperature stayed in the low 20s, so the hike was cool and comfortable and almost totally bug-free. The trail lived up to its name – it really is a “chain” of lakes. We started at the lower end of the loop near Bagley Lake and by the end of the hike had lost count of the number of lakes. Suffice to say, it was well worth the drive down. We caught various aspects of Mount Baker, many of which were positively stunning. By the time, we neared the upper end at Artist Point, the trail was starting to feel like the Grouse Grind. Getting on from the less popular starting point, we had avoided the crowds for most of the way. At less than 500 m in elevation, the hike was not especially challenging but was perfect for a bunch of keen photographers not too worried about breaking any records. The loop (11 km) plus a 3.5 km descent on the Wild Goose Trail back to the parking lot at Bagley Lake took just over five hours. This distance does not include our detour down to one of the lakes for very pleasant lunch break.